Merger control constitutes a well-established pillar of EU competition law. 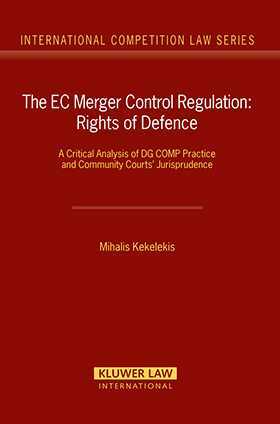 However, the drafters of the Community competition merger legislation, in view of the need to attain the imperative goal of market integration, put more emphasis on the clarification of the substantive rules applied by the Commission through enhancing its supervisory powers than on the necessity for protecting the defendant parties or any involved third parties in merger proceedings. Here for the first time is an in-depth analysis of the rights of notifying parties and third parties in merger proceedings, as reflected in the administrative practice of the Commission and the case law of the Community courts. Following a detailed exposition of the operation of the Merger Regulation and its procedures, this study covers not only the generally approved fundamental rights, such as the right to be heard or the right to access the Commission's file, but also all the other procedural rights involved in merger proceedings, such as the right of notifying parties to propose commitments outside the time-limit required. It examines the rights of the parties from the pre-notification stage through the first and second phases of the proceedings, with particular emphasis on notification, preliminary investigation, statement of objections, access to the file, oral hearing, commitments, and adoption of the final decision. the concept of `sufficient interest. The study culminates with recommendations for reform of, and improvement in, the rights of notifying parties and third parties, including amendments to the Regulation and a further suggestion for the adoption of a Notice providing guidance on how the rights of these parties should be taken into account in merger proceedings. A valuable set of annexes includes the texts of the Merger Regulation, its implementing Com-mission Regulation, and the DG Competition Best Practices on the Conduct of EC merger con-trol proceedings. As a detailed examination of the rights of notifying parties and third parties in EC merger proceedings, and an important blueprint for detailing the rights of these parties, this study will be of immeasurable value for practitioners and business people involved in European business merger activities, as well as for interested academics. Preface and Acknowledgements. Table of Cases (alphabetical order).Table of Cases (chronological order). Table of Legislation. I. Introduction. II. Background to the EC Merger Regulation and its Procedures. III. Rights of Notifying Parties and Third Parties in Phase One Proceedings. IV. Rights of Notifying Parties and Third Parties in Phase Two Proceedings. V. Summary of Recommendations and the Adoption of a Notice on the Rights of Notifying Parties and Third Parties in Merger Proceedings. VI. Conclusion. Annex I: Council Regulation (EC) No 139/2004 of 20 January 2004 on the Control of Concentrations between Undertakings (the EC Merger Regulation). Annex II: Commission Regulation (EC) No 802/2004 of 7 April 2004 Implementing Council Regulation (EC) No 139/2004 on the Control of Concentrations between Undertakings. Annex III: DG Competition Best Practices on the Conduct of EC merger control proceedings. Annex IV: EC Merger Control Procedure Diagrams. Bibliography. Index.